VANCOUVER - B.C. Lions quarterback Jonathon Jennings delivered one of his best performances of the season in a crucial win Saturday night, but says his play wasn't motivated by recent questions about his commitment to the game. 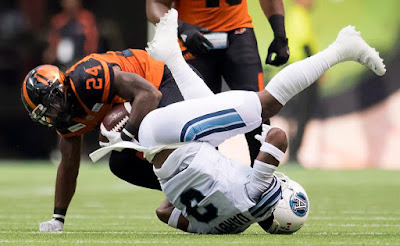 Jennings threw for 199 yards and a touchdown and also rushed for 47 yards in three carries in the Lions' 26-23 victory over the Toronto Argonauts (3-11) at B.C. Place. The win keeps the Lions (7-7) in the thick of the CFL West playoff hunt, while the Argos are on the brink of elimination with the defeat. Saturday's strong showing came after B.C general manager Ed Hervey appeared to question in an interview with Postmedia whether the 26-year-old is committed to becoming an elite quarterback. Jennings was the Lions' starter at the beginning of the season, but then lost the job to veteran Travis Lulay. He took over again last month after Lulay was sidelined by a dislocated shoulder. Hervey said he sees "flashes'' of good things from Jennings, but added that the Columbus, Ohio native is "rarely'' seen around the team's training facility enough to show that he has what it takes to take his game to the next level, a comment that the quarterback's agent refuted in a statement. Asked whether Hervey's words spurred Saturday's performance, Jennings said no. "I'm just thankful for my teammates. I got a lot of support from my teammates. And I'm just happy we got the win,'' he said. "After last week ... we should all be criticized,'' the coach said, referring to B.C. 's dismal 40-10 loss in Hamilton. "It was nice to see him make some good throws, make some good reads. I'd like to see him do more of that,'' Buono said. Toronto's McLeod Bethel-Thompson had a woeful outing, throwing four interceptions and a touchdown and finishing with just 97 passing yards. In the fourth quarter, he was replaced by James Franklin, who did much better, finishing with 103 passing yards and two touchdowns. It was B.C. 's lone touchdown of the night, with the rest of the scoring coming from kicker Ty Long, who had six field goals and a single. The game's final minutes were stressful, Long said. The loss effectively ends the Argos' race for the post-season. It could also put Bethel-Thompson's job in jeopardy. "We'll take a couple of days, talk it over,'' he said. Saturday's result also clinched a post-season spot and a home playoff game for the Ottawa Redblacks. NOTES: Toronto receiver S.J. Green took a massive hit from B.C. 's Jordan Herdman in the first quarter. The Argos slotback was down on the field for several minutes before eventually walking off on his own. He later went to the Toronto locker-room and coach Marc Trestman said he "seemed fine'' after the game. ... B.C. running back Jeremiah Johnson had 19 carries for 118 yards - the first time this season he's rushed for more than 100 yards. ... The Lions' win marked Wally Buono's 280th coaching victory. He is the league's all-time leader in coaching wins.